It's been years since Wild Dog -- the gun-toting, hockey mask-wearing vigilante created by Max Allan Collins and Terry Beatty -- has appeared regularly in the pages of DC Comics. Today, though, he got a big, splashy reveal in one of the most surprising places imaginable -- Young Animal's Cave Carson Has a Cybernetic Eye -- all while appearing on Arrow and having some variation on his look teased for the Green Arrow comic book. The character first appeared in Wild Dog #1 in 1987, making him one of the first new superheroes created following Crisis on Infinite Earths. As the original promotional material for his series used to say, "his super power is guns." Star athlete Jack Wheeler went to college on a football scholarship, but had to drop out and become a mechanic after an injury forced him off the team and he couldn't afford tuition. Before working as a mechanic, though, he enlisted for a tour of duty with the U.S. Marines, only to see most of his friends killed by a terrorist bomb. After returning home, he fell in love...but the woman he was in love with was gunned down in a seemingly-random shooting, later revealed to be a hit because her father was a reputed mobster. Wheeler snapped and became Wild Dog -- a vigilante beloved by the public for "cleaning up the streets" but wanted by the police for his brutality. 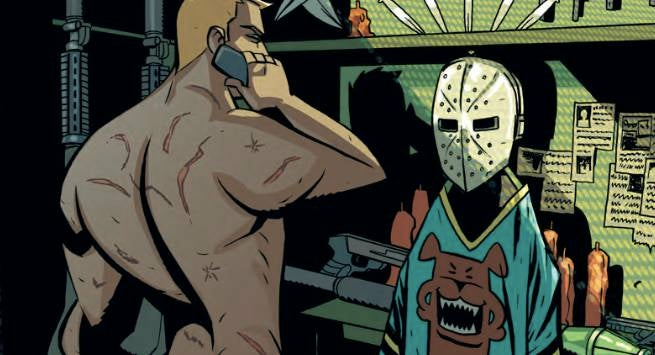 It's in his garage -- Wheeler Auto -- that audiences see Jack Wheeler open up a locker to reveal his arsenal, his Wild Dog costume, and to say he'll "bring the dog" in today's issue of Cave Carson Has a Cybernetic Eye. So...yeah. Expect more on that front. A group of men dressed in Wild Dog costumes appear on the cover of Green Arrow #1, released in June, although the character does not actually appear in the issue. "That's not coming right away but it's coming down the pipeline," Green Arrow writer Ben Percy said of Wild Dog. "That first cover is sort of previewing some of the obstacles that lay ahead in the first few Rebirth arcs. I won't say too much except that there was a lot of discussion at the DC offices about how we could channel some of what was going on in the news, particularly what was going on in Oregon at the Malheur Nature Reserve which was taken over by that militia." After his own series failed to make him a star, the character would appear in Action Comics Weekly before fading mostly into obscurity. His most recent appearances on the printed page were in an alternate-reality story in Booster Gold, in which Wild Dog was part of a team of revolutionaries led by Green Arrow and working against Maxwell Lord and his army of OMACs. "You gotta go to [writers] Geoff [Johns] and Jeff [Katz] for that one," artist Dan Jurgens said when ComicBook.com's Russ Burlingame asked him why Wild Dog had been chosen to team with a group of DC A-listers in Booster Gold #8. "I kind of enjoyed it. Took me back to those Action Weekly days!" During his Booster Gold run, Wild Dog was depicted as being very conservative, something that seems likely to play a role on Arrow since Oliver Queen is now the liberal mayor of Star City. Arrow airs on Wednesday nights at 8 p.m. ET/PT on The CW. The next episode airs tonight. Cave Carson Has a Cybernetic Eye #1 is on sale now. You can get it at your local comic shop or order it digitally on ComiXology. Cave Carson Has a Cybernetic Eye #2, which will likely feature more Wild Dog, will be on sale November 16.